They slip on easily. They're comfortable. They're Florsheim FS2405 Men's Composite-Toe Dark Brown Lucky Casual Slip-On Oxford Shoes. When you need trustworthy men's work footwear with a safety feature like composite toe caps thrown into the mix, you'll want these F ... (see full details) (see specifications) #FLSFS2405. They slip on easily. They're comfortable. They're Florsheim FS2405 Men's Composite-Toe Dark Brown Lucky Casual Slip-On Oxford Shoes. When you need trustworthy men's work footwear with a safety feature like composite toe caps thrown into the mix, you'll want these Florsheim slip-on shoes on your feet when you head into the workplace. The brand designed these brown leather shoes to protect your toes against impacts and compression that can be caused by falling or rolling objects, and they did so in a lightweight design you'll appreciate. Focus on these rugged and stylish men's oxfords from Florsheim. Dark brown leather uppers give this slip-on pair rugged style and reliable durability you need for the job site. They feature direct-inject rubber outsoles for sure-footed traction on a variety of surfaces. The TPU outsoles of the men's composite toe footwear are durable to prevent corrosion for longer-lasting wear that stands up to a beating. Whether you're headed to the office or the construction site, you'll appreciate ASTM-approved composite safety toe caps to guard your toes against impacts, falling objects, and other potentially toe-crushing hazards. Comfort features abound in these Florsheim oxfords. On the inside, you'll find them lined with DriMax super absorbent lining. This innovative material works to wick away moisture and perspiration so you stay dry and cool throughout your day. Direct attach polyurethane midsoles combine with removable polyurethane inserts to soften and cushion each and every step for all-day comfort you can count on - casual slip-on shoes like these are hard to come by, so make sure you equip your feet with the comfort and toughness of this Florsheim footwear. Your steps will be cushioned, while your toes will be guarded by the lightweight, built-in safety toe caps. You can't even tell these are composite safety toe shoes, (as that give off that professional vibe), but you'll be glad you're wearing them. 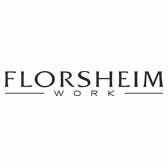 Florsheim wanted to make sure you have the ultimate comfort, so the PU midsoles and removable PU inserts are created to support your every step. Stay protected and comfortable with slip-on style and pick up your Florsheim FS2405 Men's Composite Toe Dark Brown Casual Slip-On Oxfords today from Working Person's Store. The lightweight composite safety toe caps provide a much-needed layer of protection for your digits, while the casual slip-on style of these Lucky shoes makes for easy prep before your big work day. Order your pair today! I've almost worn out my second pair over the last 5 years and will be ordering another pair as replacements. These are really comfortable shoes that meet all workplace safety requirements with all the appropriate ANSI tags and numbers. A nice fitting shoe that is comfortable. Has a professsional look with the added safety toe that I need. My husband likes this shoe for looks, comfort and quality. I was amazed with how dry my feet are at the end of the day. A very nice shoe indeed. Bought these shoes because I could not find a pair of slip on durashock Wolverine's, they have been discontinued. They looked great and felt great out of the box. I am a shop supervisor at a heavy duty truck dealership. With in the first week of wear the lower portion of the soul began to separate from the center portion. I tried to use gorilla glue with no success. Will not buy this product again, not tough enough for my application. I am compelled to write to you today because of what I went through today trying to find a pair of boots. In a day and age where social interaction is at an all time low and customer service always seem to fall by the wayside, I wanted to let you know of the absolute gem you have working for you. I called your company to do research on some boots you offer and left a phone call wanting to be a lifetime customer. Michael was arguably the most considerate and helpful human being I have ever met. I do not say this lightly. I work for UPS and have an enormous interaction with the public and it has been years since I have been able to shop either online or in person and have as excellent an experience as I had shopping at your company today! Thank you to Michael, and thank you to your company for the wonderful experience. Florsheim: Men's Composite Toe Casual Slip-On Lucky Oxford Shoes FS2405 is being added to your cart.